The #1 Dumpster Odor Control on The Market Control Odors • Reduce Flies • Help Reduce Germs & Disease Dumpster Cure™ is a triple action, destroying granule: An all natural granule is designed to absorb twice its’ weight in liquid for maximum absorption of unwanted odors. 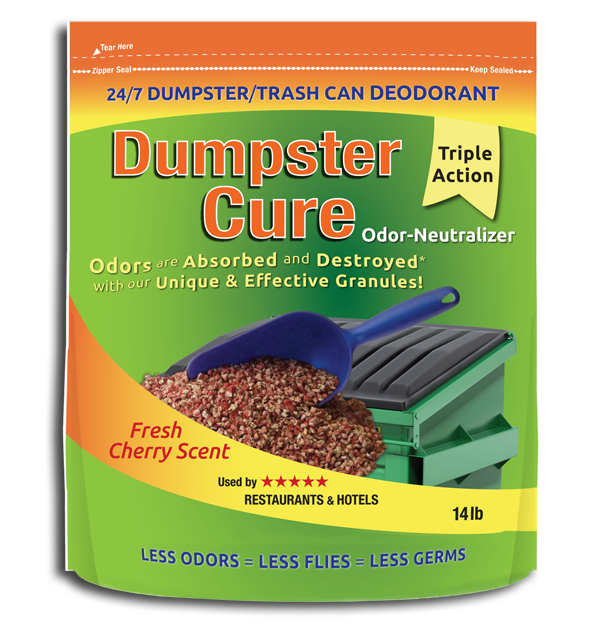 Specifically formulated to neutralize trash odors. Has a pleasing cherry scent which minimizes odors, flies and germs. 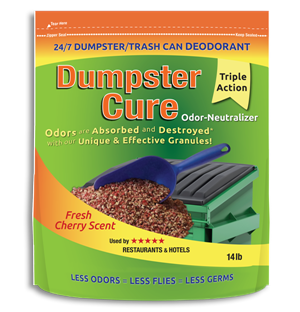 Dumpster Cure™ is designed to be used in a wide array of industries such as: Hotels, Restaurants, Golf Courses, Municipalities, Trash Services. It’s even great for residential use at home. Simply cast granules into empty dumpster or on top of debris. Cast as many granules as needed to cure the odor and fly issues. Refresh throughout the day as needed. Use as necessary as all odor issues vary. 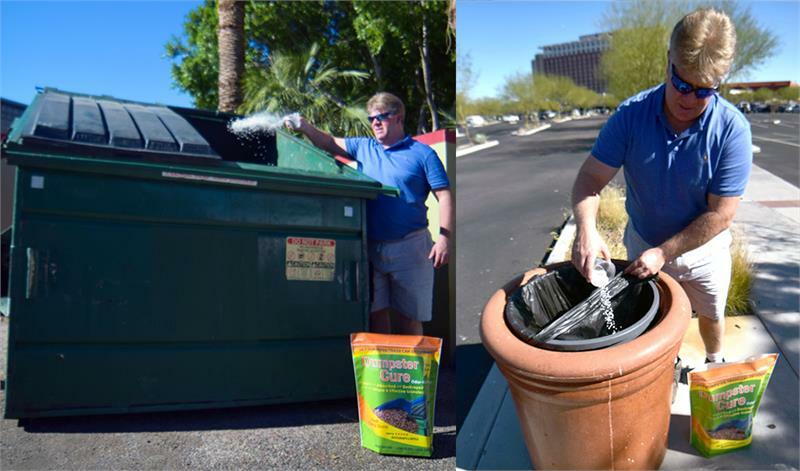 Simply add granules between trash can and liner OR if trash is being stored for a period of time, pour granules directly into the liner before sealing and storing trash. Hotels, Condos, Entrances, Pool grounds, Restaurants, Patios, Bathrooms, Golf Courses, Club houses and even homes! A fresh smelling trash can is a must in high walking traffic areas Freshen up your trash cans before your business day begins Great in bathrooms to help freshen with a cherry scent Keep your patrons happy while dining outside Reduce Odor in Trash Shoots* Control offensive Trash Compactor** odors *These odors rise up through the trash shoots and leach up to each floor of the complex. **Commercial trash compactors will use a large amount of granules depending upon the size, temperature and frequency of pick up.